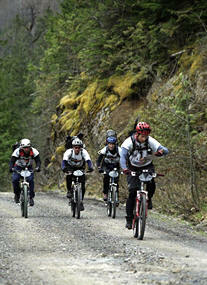 Raid the North represents the true spirit of adventure racing. rugged and diverse backcountry of Canada. Since 1998, Raid the North events have been designed to showcase the natural highlights of the host region environment. From the wild mountain terrain of Alberta and British Columbia, the vast matrix of lakes and rivers in Ontario's shield country, to the rolling hills and rushing water of Quebec, Nova Scotia, and New Brunswick, Raid the North has featured it all. What keeps the Series' cult following coming back each season, is the thrill and challenge of the journey in these amazing locations. A Raid the North team is a coed group of four. Some participants have endurance sport backgrounds but MOST who take on Raid the North are outgoing, adventure enthusiasts JUST LIKE YOU who have a passion for taking on a new challenge. WHAT DOES A RAID THE NORTH RACE ENTAIL? 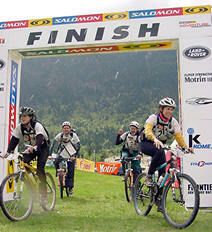 Traditional adventure racing involves teamwork, strategy, route selection, nutritional planning, and sleep deprivation. To capture these elements in a weekend event, Raid the North is designed as a 24-36 hour race. While on course, your team will paddle, mountain bike, and trek, often negotiate fixed ropes, and sometimes swim or raft, through a series of checkpoints until your complete teams reaches the finish line. A typical distance covered by a finishing team is around 130-150 km. Each race also offers an additional, advanced section to cater to the highly competitive teams. Not all teams reach the finish line, however; first-timers and experienced teams alike. The finish line is a VERY small part of the Raid the North experience. It is the journey, going further, digging deeper, and inspiring your teammates to push a little longer that create the indelible memories that last a lifetime. This is the nature of the sport and is what keeps people coming back to race again and again. WHY IS RAID THE NORTH UNIQUE? Our vision for every Raid the North is to create discovery through adventure. Each racecourse is designed as a journey, where the natural challenges provided by the landscape are all that stand between your team and the finish line. Contrived challenges or out-and-back, mandatory routes for the sake of adding difficulty are NOT in the spirit of Raid the North. ABSOLUTELY!!! Raid the North is as much a starting place in adventure racing as is the Frontier Adventure Challenge Series. Remember, from the early 1980's to the start of the new millennium, people from all walks of life got their start in adventure racing within the expedition-style framework. Raid the North offers a vastly different experience than does the Frontier AC sprint-style of race. If the more traditional form of adventure racing is what you're after, then Raid the North is for you! DID YOU KNOW? The winning team in any 36 hour Raid the North event travels slower than the last team to cross the 8 hour Frontier Adventure Challenge finish line. RTN is done at a SLOW PACE! Please read through the many pages within the Raid the North and AR Resources sections of our site. We pride ourselves on providing as much information from experience as possible so that your team gets the most out of your Raid the North race. Pages such as ‘Getting Started in AR’, ‘Preparing for a Race’, and ‘Training Tips’ help in the early stages while the newly updated and inspiring ‘Photo Gallery’ will keep your thirst for adventure at a high. So pick a race, grab three friends, and we’ll see you at the start line! Real Wilderness. Real Navigation. Real Adventure.